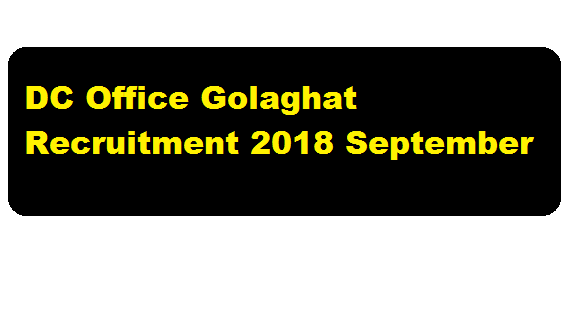 DC Office Golaghat Recruitment 2018 September | Project Officer & Assistant Posts :- Office of the Deputy Commissioner, Golaghat has published a recruitment notification for the month of September 2018. According to the DC Office Golaghat Recruitment 2018 September, Applications in standard form are invited (at the Development Branch of, the Deputy Commissioners Office, Golaghat from 10 AM to 4 PM) from intending candidates for the various posts in contract basis for PMAGY (Prime Minister Adarsha Gram Yojana) Scheme in Golaghat District. We have discussed in details about this DC office Recruitment in below section. In this section, we will discuss in detail about Recruitment of various posts under DC Office Golaghat Recruitment 2018 September with all the details and requirement. Educational Qualification: Candidates must be a Post Graduate from recognized University (Preferably Post Graduate in Statistics/Social Science/Economics). 1 Year Diploma certificate in Computer application from Govt. registered institute. Educational Qualification: Candidates must be a Graduate from recognized university. 1 Year Diploma certificate in Computer application from Govt. registered institute. Period & Nature of Engagement:The contract will be for a period of 3 years only subject to annual renewal on the basis of performance. Interested candidates having the requisite qualification may send applications to the following address. The shortlisted candidates will have to appear for a interview on 10-09-2018 from 10:00 A.M to 4:00 P.M at the Office of the Deputy Commissioner, Golaghat. The candidates must bring their original testimonials and also one set of photocopy of the testimonials (self-attested) and two copies photo (passport size) while coming for the interview. 1/ No applications will be received after 4:00 P.M.
2/ The names of the shortlisted candidates will be displayed from 6-09-2018 in the Notice Board of the Office of the Deputy Commissioner, Golaghat and also available in the district website: www.golaghat.gov.in. 3/ No TA/DA will be borne by the Authority.